It looks like Amazon is getting ready to release a new Kindle next week. It might only be available in China, but let’s hope it turns out to be more interesting than that. The image above turned up on a Chinese website earlier this week. 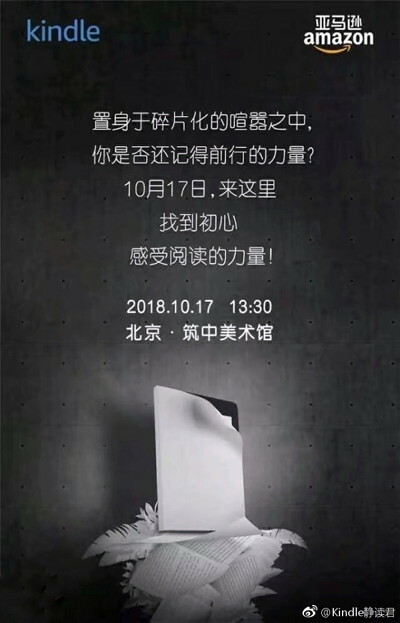 It’s an invitation to a Kindle event in China on October 17th, but why would they have a new Kindle unveiling scheduled in China of all places? It might be a model specific to the Chinese market like the co-branded Kindle X, which includes a Chinese ebook store in addition to Amazon’s ebook store. But if a new Kindle is getting released in China next week, and it’s not just a remake of a current model, then a new Kindle will most likely get released in other markets as well, especially since Kindles aren’t even that popular in China. The timing makes sense. If a new Kindle isn’t announced soon it’s not going to happen in 2018. Last year they announced the Kindle Oasis 2 on October 11th. The entry-level Kindle and Kindle Paperwhite are both due for an upgrade. The former has the same outdated, low-resolution screen that ebook readers used 8 years ago, and the Paperwhite is a lot heavier than other 6-inch models and it’s the only current Kindle without Bluetooth for audiobooks. With pre-orders starting on October 16th for the new Kobo Forma, it wouldn’t be surprising to see Amazon announce a new Kindle at the same time. And since the Kobo Forma is using a new flexible Mobius screen from E Ink, hopefully the new Kindle will too. Stay tuned for a possible announcement early next week! Have you seen the size of that bezel? I doubt it’s a new Kindle. It says Kindle in the image. They don’t call the tablets Kindle anymore — they’re just Fire tablets. That’s the first thing I noticed – holy smokes that bezel is ridiculous. Especially being the top bezel. It’s not like you’d hold it from there so being larger serves no purpose. If you hold a current Paperwhite at that same angle….its exactly the same. I am guessing they are using exactly the same housing….which is disappointing. Its definitely a Kindle….they wouldn’t show pages under it if it weren’t. If Mobius the next sentence could be about “moving forward”/new tech. Also some translations I’ve seen are throwing up the word “knife” which could suggest at being “razor thin” or something. Reading from the heart is obvious could be translated as “love reading” etc. Hopefully that means it uses a lighter flexible display like the new Kobo Forma. All the rage is that this will be the new Kindle Paperwhite 4 which will most likely be a 6 inch device. Disappointing considering Kobo just came out with the 8 inch Forma. With that said, I doubt it will be larger and undercut the new Oasis being the Oasis isn’t that old. – Rubber soft coating material for better feel and grip. The new aluminum feel of the Oasis was a disaster. Of course the specs are premium higher end. Perhaps Amazon is replacing the voyage with a premium 6 inch device or perhaps the new Kindle paperwhite will be the standard premium 6 inch device which would almost certainly raise the price.